Reading some of the other information given in comments it looks like this map probably dates closer to the 1780's, although there are likely to be a few anachronisms such as the marking of the later burial ground. It looks like Presnail perhaps wasn't as diligent as he could have been with his research! I never stated that it was a definitive map, I just thought that it would be nice to share it with other KHF members. It could probably be modified here and there using other peoples research into something a bit more accurate for the period. As for the dyline process, the one I used gave a dark brown copy - but the smell of ammonia was still there! TO THE PARISH OF CHATHAM,MAY 1828"
As for dyeline copiers, were they the ones that started with a piece of yellow paper, you put the film to copy on top, ran it through rollers and an ultra-violet light and ended up with a blue print? We had one for producing copies of circuit diagrams at my first job - stank of ammonia! Lovely! At this time Brompton would still have presented a very rural view. Travelling to Brompton from Chatham in 1690 one would have seen a lane known as Dock Lane (it would not be known as Dock Road until well over a century later) leading north from the village of Chatham and its Church towards the new dockyard. As you approached the yard along Dock Lane towards the simple gate the long ropery buildings would be visible on the left (west) and the teamster’s yard and orchard in the chalk pits to the right (east). The hills ahead, to the north-east would be crowned by a large area of woodland stretching to the north and east on the brow of the hill (the woods occupied most of the area of today’s Brompton Barracks) and an occasional old chalk pit. To the east of Dock Lane hedged fields and grazing sheep stretched up and over the ridge, crossed by footpaths and tracks. On the level ground at the brow were occasional orchards and more fields, and clay quarries south of the orchards, maybe even a small brickworks. In front of the woods a road, Wood Street, led east towards Gillingham, and another (perhaps known as Garden Lane or something similar) ran parallel towards Westcourt Farm. Within only 20 years the view would be very different. Much of the above description is based on maps, but the maps can be supplemented and supported with evidence from early deeds relating to Brompton. The area now occupied by the High Street, Middle Street and Westcourt Street frequently appears in old deeds and letters from the late 17th and early 18th centuries named as “Sheeplands”. Brompton Wood is also well known from old documents as well as maps, and Wood Street sometimes seems to have been known as “Carpenter’s Lane” suggesting the wood was used as a source of raw materials, perhaps for ship- and house-building. 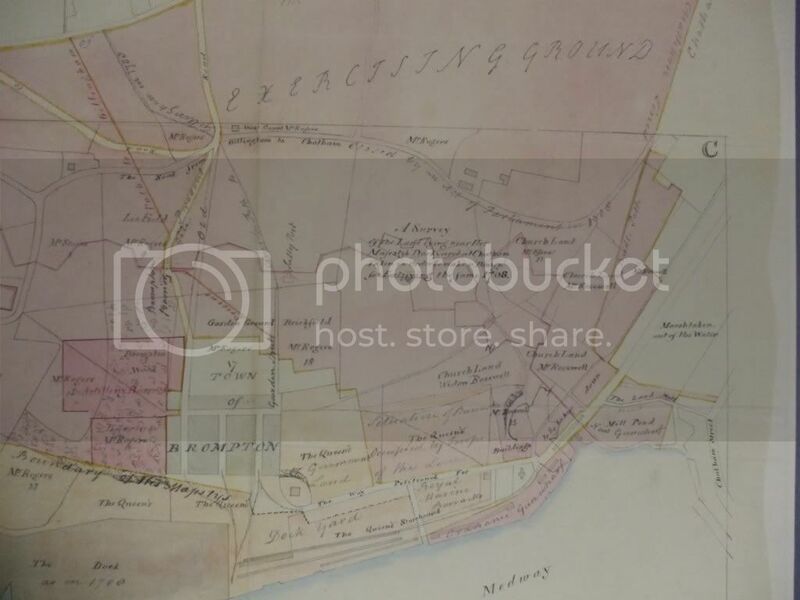 South of Wood Street and east of Sheeplands was an area of orchards known as Garden Ground, this name still appearing in deeds as late as the early 19th century. Garden Ground seems to have been bounded on the south by a lane or road running east towards West Court Manor/Farm, to which these orchards almost certainly belonged, and which is now known as Garden Street. The Garden Ground seems to have covered the area now occupied by Manor Street and Mansion Row across to the Inner Lines. The eastern half of this area was probably part of the land bought by the War Derartment in 1709 to build the Lines. To the south of Garden Ground one early 18th century deed refers to “Lomepit Bensteds” which seems to have occupied the area of the northern part of Prospect Row and the southern side of Garden Street. The name suggests that clay may have been dug here for brickmaking. Whether there was a brick kiln at the site is unclear, although by the first decade of the 18th century Thomas Rogers (the owner of Westcourt Manor) had a brickworks in operation just east of here. One of the most intriguing, but sadly unidentified, features appears on an early 18th century map in the area at the southern end of what would become Prospect Row (at this date it was just a hedge line), what appears to be some kind of pre-historic barrow or stone circle. Sadly there are no other records of this feature, so whether it was just the map-maker on a flight of fancy or if it represents a prehistoric monument destroyed and unrecorded during the building of Chatham Barracks or Prospect Row we shall never know. It is interesting to see on the map that Mr Rogers is still shown as the major land owner in Brompton on that plan. There are several early 18th century maps at the National Archives (MFC 1/85) that record in detail the houses of old Chatham that were demolished to make way in 1755 for the fortifications. There are large reports prepared under Act of Parliament by Commissioners, designed to determine who should get compensation. These date from 1708 and 1714 (the latter being when the properties were first purchased for the Government). These include names for owners of individual plots but do not describe the purpose of the buildings. The building shown on the 1709 map in Presnail in what is now Caveyard is separate to the rest of the town of Chatham and looks like a substantial house. 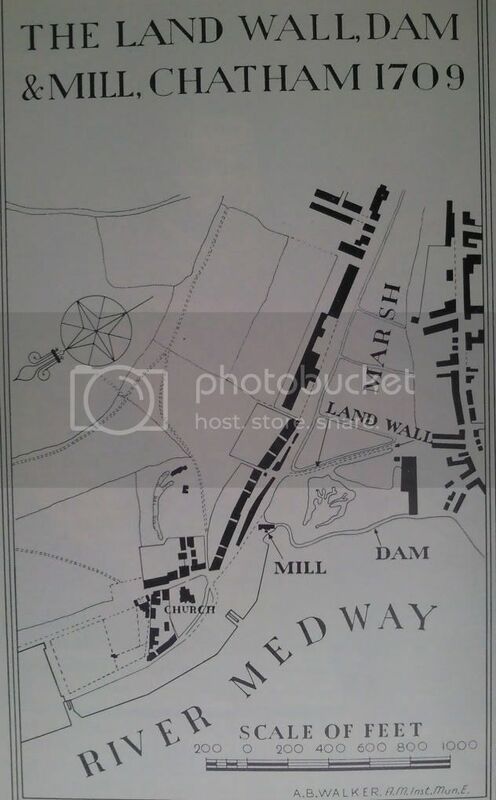 The same maps show where the mill once stood in relation to the then millpond. Here is one of the plans mentioned. Where did Presnail source his information? That's a question I seem to ask a lot looking at Presnail, and in one or two cases when I have found the original source it has been misquoted, an example being something from 1695 quoted as 1625. Presnail did a great service by writing a history of Chatham but his work needs to be treated with caution. He did not record his sources and in several instances my own research has confirmed that he is plain wrong. Military Road was a new road constructed by the Ordnance Board in c 1803-05 as part of the major refortification of Chatham and linking Fort Amherst to Fort Pitt. The Land Wall is effectively the alignment of Globe Lane. 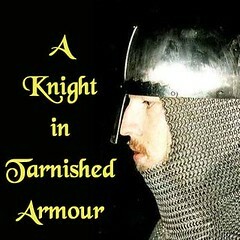 Its origins could well be medieval (or older) but the dispute about its use goes back until at least the early 18th century. The Navy Board then repaired it as the main way to the dockyard and to recover costs proposed making it a toll road. Local residents and businessmen who used the road as the main way to Brompton from Chatham objected strongly. In state papers for Charles I c 1633 one John Bendy is called upon to answer charges for using his team (of horses) to break the locked gates on a highway. This could well also be the Land Wall. Having bought the properties Government chose not to build fortifications in 1714 and leased out the buildings to a local man who then sub let them to what are described as dockyard men, fishermen and other poor people. By the time notice to quit was served on Christmas day 1755 most of the houses were broken down and slum like. The mill had long passed out of use and the river wall is described as decayed. 1804 (circa). " During the building of the fortifications local labour was employed, but Military Road was constructed by convicts who were heavily chained. Military Road, as its name indicates, was a military road and under military control. At the High Street end a pair of large gates was erected. Residents never referred to it as the Military Road but spoke of it as the Military Gates. It was once closed by a Commandant of the garrison for a whole year. He had taken offence at riotous conduct in the street." I like the 1709 map because it clearly shows 'old' Chatham around the Church. I also wonder what the buildings in what is now the Cave Yard were? So both maps were drawn by A B Walker? What did he base them on, guesses or actual contemporay documents? If on actual maps are the originals about? the compass helps. Interesting to see the position of the land wall. This map is a version of the one that appears in Presnail's history of Chatham as drawn for him by AB Walker. The book was supported by the then Medway Council and this could explain where the dye line was found. Well done for salvaging it and I wonder if there were any others. We do not know what sources were drawn on to produce the map. In Presnail's version he dates it to 1781-85 and this fits much better than a date of 1765. For example the map shows the Couvre Porte of Chatham Lines and this was not built until the American War (1779-83). The Roman road was Chatham High Street. It passed out of Rochester along Chatham Intra and down the south side of the valley. The roads shown on the high ground represent the 18th century toll road authorised by Act of Parliament and hence the name New Road. There may always have been some routes over the high ground bypassing Chatham centre but its formalisation dates to the late 18th century. I have not pinned down which is the older of the pair of roads shown but the one settled upon is that to the north i.e. the current alignment of New Road. In 1782 another Act authorised the acquisition of the land by the Ordnance Board on which Fort Pitt would be later built and I think this may have resulted in the road moving. Thanks for the annotation of buildings on the map. Many of these are known from engravings and even photographs and it would be instructive to see how many could be so identified. So little of the really old Chatham is now visible that this would be one way to understand its character at the time when it was at its most busy and when its reputation was so bad. Interesting to see the Old Bourne still flowing along the Brook although the Luton valley appears to be dry. I came across the map when I worked for the old Medway Council in the late 70's. It was in a bit of a state so I took a dyeline copy (remember them?) for my own reference. A long time later I found it again and scanned it into my computer. After stitching it together I performed some cosmetic surgery on it, the result being the tarted-up version you see here. The popular image of town stocks is often one of fun - throwing of rotten fruit and eggs etc. at the captive - the real truth however is that it was not unknown in some instances for an offender to die after being there for several days. A sobering thought. It's obviously a modern map, but do you have any idea of the source(s) used for it? The detail of the "Old Lime Kiln" opposite the Dock Yard Main Gate intrigues me as every other original map I've seen from the 1680s up to the 1880s shows that as a teamster's yard and stables. Technically it should read part of Brompton, not Old Brompton at that date! A 1765 date seems reasonable from details like the number of houses in Prospect Row and Mansion Row, though the building areas shown in Middle Street & Wood Street don't look quite right. It's also a shame that the roads/paths from Brompton across the inner & Great Lines aren't shown. It's also got me wondering whether Military Road would have been in place behind the lines at this date. In particular (based on nothing other than having assumed) I had always thought of Mansion Row having been built along the edge of the Military Road, but I'm now wondering if it was the other way around. The apparent line of buildings along the edge of Dock Road between the Main Gate and the Barracks also has me intrigued, they show up on a 1786 map I have too, and I still have no idea what they were. Presumably they went when Melville Hospital was built. I thought Mr Fullager's farm just to the east of Westcourt Farm, and the road north between them would have been shown too, as they both occur on the 1756 map. I'm not so familiar with the development of the main part of Chatham, but I love the detail of the stocks near the Luton end of the High Street. Maybe they should be brought back! And it clearly shows how 'New' Chatham (as opposed to medieval Chatham Village clustered around the church) really was just two long ribbons of development.